There are many potential reasons why the world's leading thermochronology blog has been utterly silent for the past few months. This has nothing to do with the world of thermochronology, which as I'll discuss in a bit is as cutting edge and fast paced as ever. No, this has more to do with the authors life, motivation, and workload. I am attempting re-entry, this time with the proper heat sheild as to avoid blog burn up. The score so far, sense 0, tangential metaphors 1. 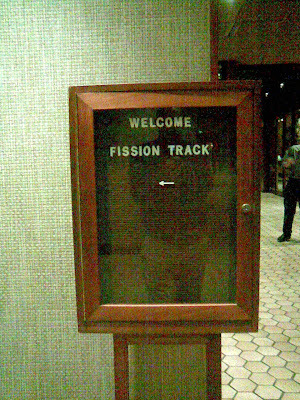 I am going to report on last week's International Thermochronology Conference (called FT2008 as a remnant of the meeting's origin as a fission-track conference), probably in installments of some kind. This was my first "specialist" type conference, which I have to say is a great idea. First off, I was interested in all of the talks and posters. This of course never happens at large conferences. Well, to be fair, I might find all of the presentations at AGU or GSA interesting if I was an expert/aficionado in the subject, it is tough to get into things that you just don't get (like cricket). In addition, there was only one session, everyone saw every talk and had time to go to every poster session. No dog-eared copy of the program or guestimates of if you can make it to the next room in 2 minutes. No, once set your were firmly planted in the session. There were enough coffee and poster breaks that I didn't get meeting sores. But I think the best part of being at a specialist conference is that it gives the attendees a chance to discuss things that wouldn't really fit at AGU, GSA, EGU, or even a Goldschmidt (although to be fair I haven't attended the latter two). We all have issues with data collection, analysis and reduction, modeling, and/or consistency. We as a community have specific techniques, or aspects of specific techniques we are still trying to make sense of. And, we are all interested in new developments in the hardware and software we use every day. These things just don't make most large conferences. These things came up all the time at FT2008, both in the formal sessions, as well as over beers later on. Not that it was all songbirds and sunshine. There were a fair number of talks that were just not that great. Like a soufflé, thermochronology is something that it is easy to F-up; in the field, lab, or at your computer. There were too many talks where I got the feeling the author had never read many thermochronology papers. This isn't much of an exaggeration, I'd say one of the most glaring errors involved ignoring (sometimes landmark) previous work from the same field area. Usually though it had to do with the study design and sampling strategy, or interpretation. But today I'm going to talk briefly (read: show pictures) about the pre-meeting field trip. This was my first trip to Alaska, and I was very lucky to get in on the 2.5 day trip north to Denali. The trip included about 40 people, faculty, students, and even some industry and government folks. The trip covered a lot of different topics, and was for most of us an introduction to the geology of South Central Alaska. This may seem obvious, but the trip really reinforced to me the enormity of Alaska, and the complexity of Alaskan geology. The area we discussed was larger than some states. Exposure is not ideal, neither is access. And, like many areas that are still active, there are generations of structures and events that are continually being modified and obscured. As far as rocks go, most of the features we saw were large overview things, the trace of the Denali and Castle Valley Faults, some of the different large mountain belts, features from the 1964 earthquake, etc. We did see some excellent exposures of some of the ginormous piles of conglomerates shed off the various mountain ranges. I make no pretense of being a sedimentologist, but even these had me impressed. 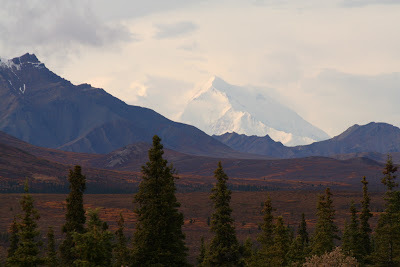 The weather hid most of the dramatic views on the first day, but we did have this one fantastic view of Denali from the park road. We were also smack dab in the middle of the fall colors coming out. This is a picture I took from Honolulu Creek, one of the exposures of these piles of late Miocene-Pliocene conglomerates we spent some time arguing about. The exact age of the deposits isn't too well constrained, but they are believed to be correlative to the Pliocene Nenana gravels. The Nenana gravels are interpreted by the field trip leaders to result from the unroofing of the Alaska Range. The meeting included some talks I'll hopefully post about that discuss some of the more recent thermochronology in this part of Alaska. We did talk a great deal about one of the more "landmark" thermochronology papers that happens to come from this area, which focused on an elevation transect all the way up Mount Denali (see Fitzgerald et al., 1995; the top of the fossil apatite fission-track partial annealing zone is at about 3800m). More later, I bought some sourdough starter while there and now need to go attend to loaves. 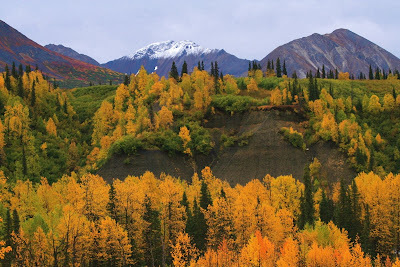 Fitzgerald, P.G., Stump, E., and Redfield, T. F., 1993, Late Cenozoic uplift of Denali (Mt. McKinley) and its relation to relative plate motion and fault morphology, Science, v. 259, p. 497-499. Cool! Can't wait to see/hear more! Life Long Scholar - I was surprised we had such a nice view. On the first part of the trip, we spent a lot of time at "Denali viewpoints" looking at a cloudbank and holding up a photo of Denali someone took on a sunny day. I was not even sure the mountain existed for a while. I've been to couple very focused conferences now and love them. The big ones are great too, but they are more about socializing ... er, I mean 'networking' ... it seems actual science is better accomplished at the small ones. Beautiful scenery ... still have never been to AK ... gotta get up there. Three people I know from my university Cal State U Fullerton went, did you meet anybody from said institute?? Emi - You bet, I'm pretty sure I even had beers with them! Phil Armstrong students I believe. Heck yeah!! Jenny and Kassi are his grad/undergrads and great friends of mine - I just went out for beers with Jenny saturday night. I love Phil, he's without a doubt the reason i have a job in geophysics right now. Awesome! Welcome Back. Theres no question that small meetings are great for our science. The Penrose and NSF-sponsored small meetings I've been to shaped my career considerably. I'd argue also that they are particularly important for young scientists, because it's one thing to shake hands with 500 people at AGU, its another to spend a week locked in a room with 50 people. Wow, where was this blog last year when I was stumbling through earth science?! What a beautiful picture of Denali! You got lucky. Hope you enjoyed your visit. You picked a great time to come. Fall is fleeting here, thought lovely. We already have quite a bit of snow. nh92 - I was here! Too bad the geoblogosphere couldn't have helped you with earth science. the dunns - It was a great time of year to be there. This was my first time in Alaska, but the crisp weather really suited the scenery for me. Musewings - Ahhh, sourdough bread, reminds me, I need to go feed my starter! I live in Peru and can vouch for the reality of earthquakes. Being prepared and even having a kit handy is a wonderful idea. Thank you for promoting this potentially life-saving idea. this blog is so interesting! i love the insite!! keep it coming! I have to admit geology is not one of my strong suites...in fact, it's a suite I don't have at all. But I do enjoy your blog very much. Thanks for the great visuals. I for one would love that J.O.B of finding good pictures and swapping them for money just like we all do as kids … you would be swapping marbles, stamps, cards you name it you swapped it!, now wasn’t that fun fun fun excellent what! … So could you do this to earn while getting the same buzz like we did as kids from swapping … Just like these pictures here worth some swapping credits … money huh? Who needs it? Hi, I stopped to visit because of your blog of note recognition and also i like to visit spaces outside of my usual framework. Your photographs are amazing and good luck with the rocks and such! I'm glad I discovered your site. I'm a closet Geologist and have a bad habit of collecting rocks when I go climbing.